Made from scratch, from our family to yours. We serve fresh, locally-sourced, elegant comfort food in Lake Oswego. To support the local economy we create every dish using fresh, seasonal Northwest ingredients. On the run? At the desk? 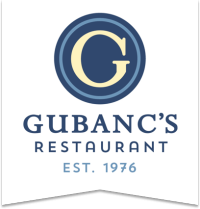 Gubanc’s is the best takeout around. g = gluten-free - Our kitchen contains ingredients with gluten. We cannot ensure that cross contamination will never occur. Choice of turkey or tuna; egg, cheese, tomato, cucumber, carrots, red onion, red bell pepper, sunflower seeds on a bed of greens. Choice of salad dressing. Garlic, parsley and lemon marinated chicken breast, romaine lettuce, oregano-lemon vinaigrette, vine-ripe tomatoes, cucumbers, feta cheese, kalamata olives, pepperoncini, red onion. Changes often! Ask for our current version. © 2019 Gubanc's Pub. All rights reserved.